Here’s something fun! 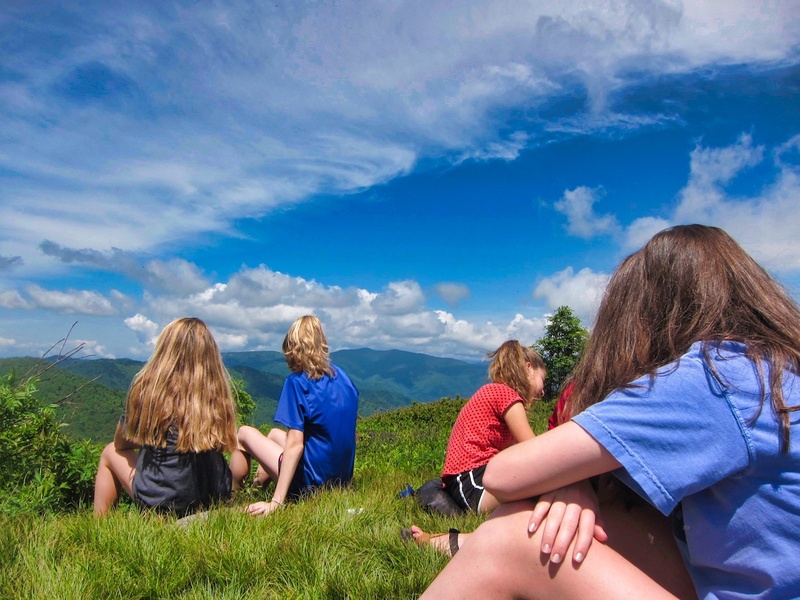 You might be anticipating your camp session later this summer, or you might be feeling nostalgia about time at camp, but you are definitely needing a little dose of camp life to get you by. If so, it might be time to pull out a classic camp movie. But which kid-friendly movie to choose? Thinking about the classics, Corrine Sullivan at Popsuger makes several great suggestions. You may have already seen several of these, but when you’re feeling “campsick,” it makes perfect sense to watch any of them again. Enjoy! Today we saw more evidence of just how quickly your girls have taken to life at camp. It’s just the first day of activities, and everywhere we look, both the new and returning campers are having a great time with each other. 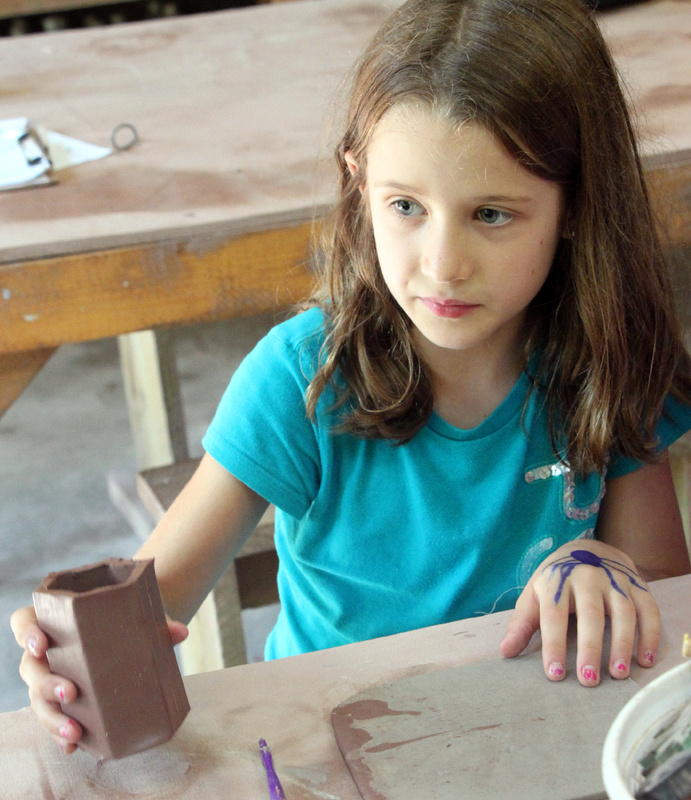 At all the craft activities, hands were busily creating, weaving, painting, pressing clay, trying new friendship bracelets, and decorating all sorts of things. There were balls bouncing on the tennis courts, in the gym for basketball, and out on the gaga ball court. 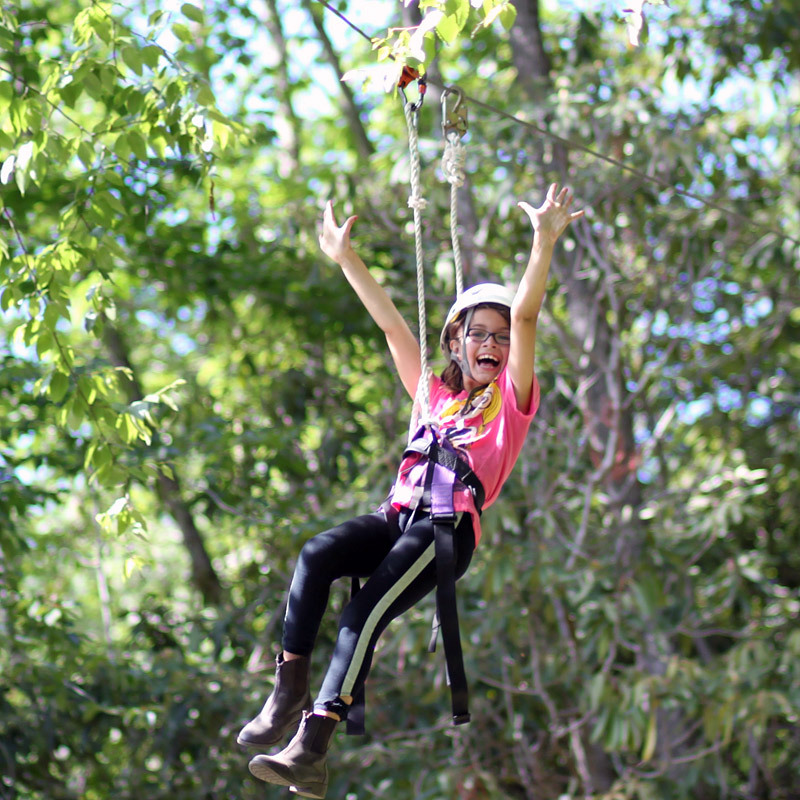 Girls climbed all three sides of the Alpine Tower while others took wild rides through the trees on our zipline course. 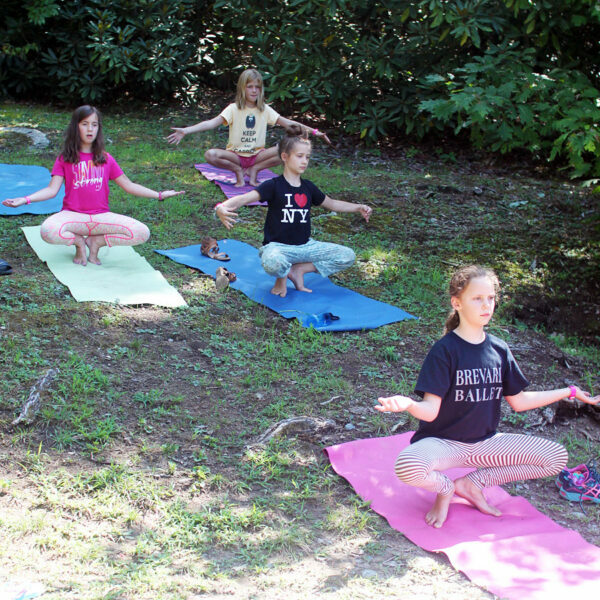 Girls stretched and posed in the yoga class and made up improvised scenes in the drama activity. Dozens of arrows and .22 caliber ammunition were (respectively!) 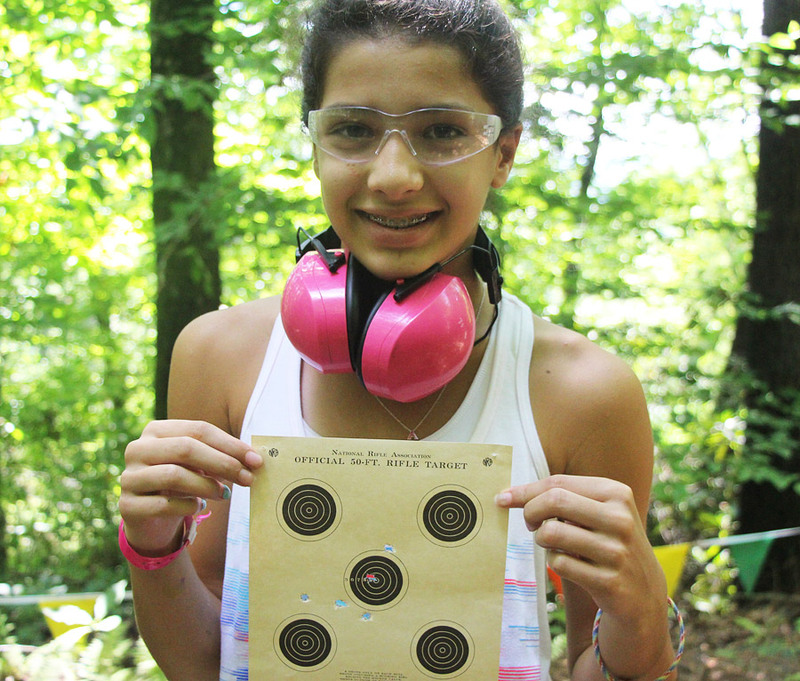 shot at archery and riflery targets. The sound of the diving board thumping and water splashing all day meant the lake saw lots of action too. Camp life was buzzing with action. Add to that an absolutely perfect day of weather— brilliant blue skies and sunshine all day, no rain, low humidity and a high temperature barely above 80 degrees —and being here in the mountains was wonderful. Did you know that you can always check the weather conditions here at camp by visiting our weather station on Weather Underground? On our station page you can find real-time and historical data, as well as weather forecasts for our area. 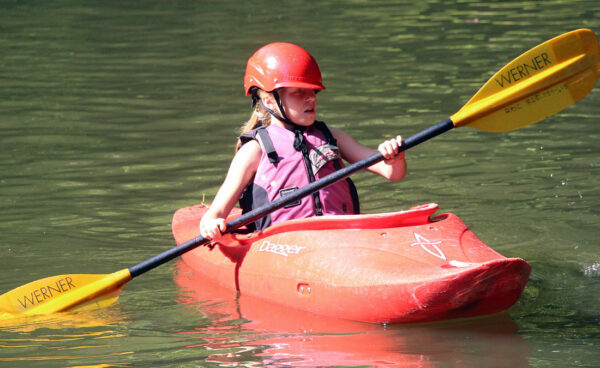 Today was also the first day out on the water for our kayak camp girls and their instructors. The girls practiced their “wet exit” maneuvers (escaping from a kayak after it turns upside down) in the lake yesterday as a refresher, and spent time double checking their boats before loading a van and trailer with other paddling equipment, camping gear and food for their first two-day river trip. 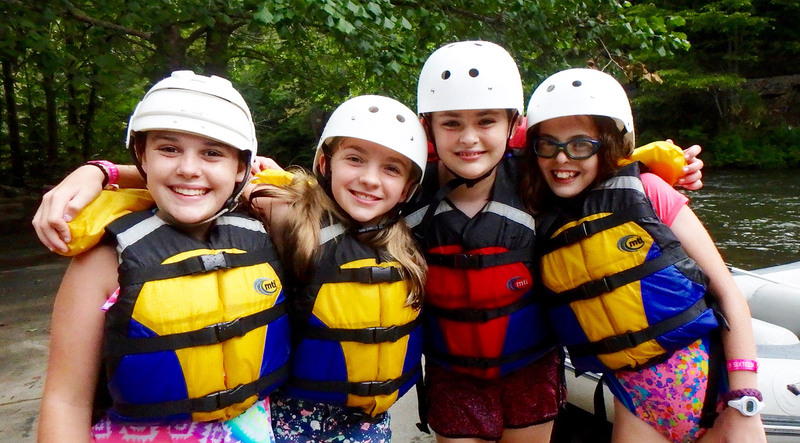 These girls already knew each other from camp last summer and had already spent a good amount of time paddling together, so right away they were excited to be set for the next week of river trips. Their plan is to paddle a different river everyday, so we’ll keep you posted about their progress. Describing all the action, the activity that enlivens camp, like this might give you the wrong impression. The busyness is not stressful or burdensome. Just the opposite; there’s a carefree element to it. The girls are relaxing as they play. They’re loosening up while getting to know each other. They’re not rushed from one thing to another. Our daily schedule builds in free time and snack breaks (our famous muffin break in the morning, for example), and has an easy pace. We eat great food, get plenty of rest, and spend the majority of our day outside. There’s time for conversation all day long, time for silliness, dressing up, and a good laugh with friends. A camper told me today that she loves camp because “it’s so chill.” I think she’s noticing and appreciating the relaxed pace of life at camp, especially in contrast to life at school. I suspect that’s true for lots of girls at Rockbrook. 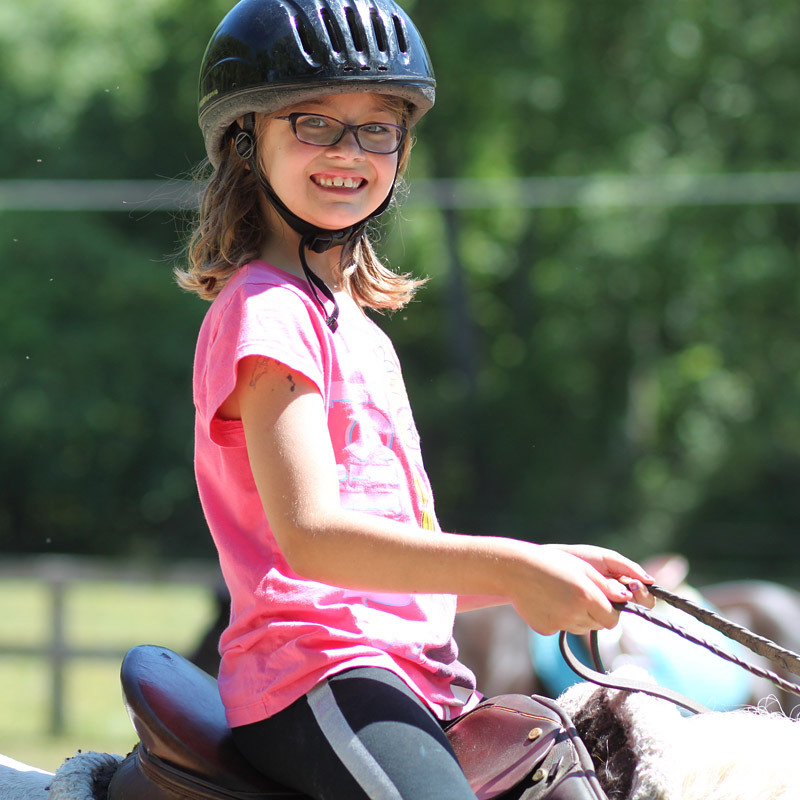 However ironic, they love the relaxed feeling along with the variety of action built into the rhythms of camp life. What a great way to recharge and enjoy yourself. Your girls are already thanking you. Robbie Francis from Go Swan Filmworks returned to camp for another day filming this week, and with more of his brilliant editing, produced this fun 2-minute video for us. 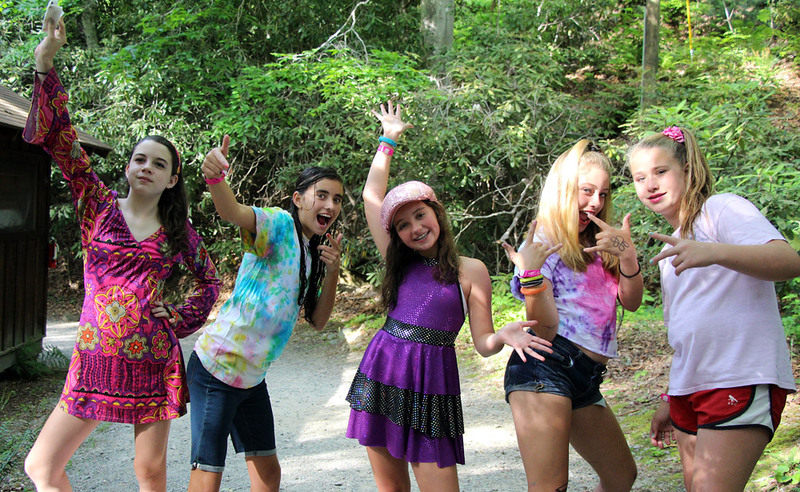 Take a look and you’ll see what I mean— these girls love camp. Today we saw proof just how quickly the girls have both settled down and fired up here at camp. 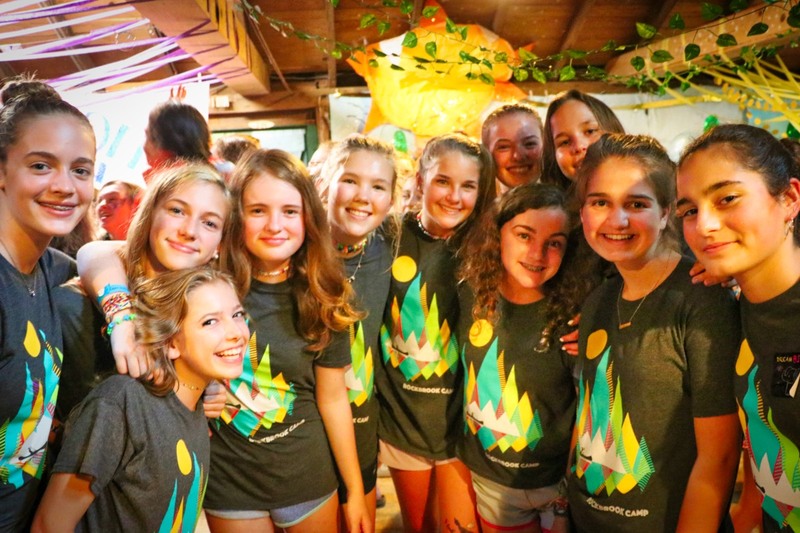 In just a couple of days, most of ambivalence about camp— remember, it’s very different from home —the uncertainties about what each day will be like, the activities, and the other girls in their cabin have for the most part faded and been replaced with understanding, friendship and enthusiasm. The girls now understand the rhythm of camp life: the 120-year camp camp bell and what it signifies, the crucial importance of “Muffin Break” (today’s flavor was mint chocolate chip, by the way), when is the best time to take a shower, that around here singing (loudly!) is highly encouraged, and lying down in your bunk after these incredibly active days feels really good. Now everyone has a buddy or two to romp around with, as well as their whole cabin group to play with at meals, rest hour, and in the cabin before bedtime. 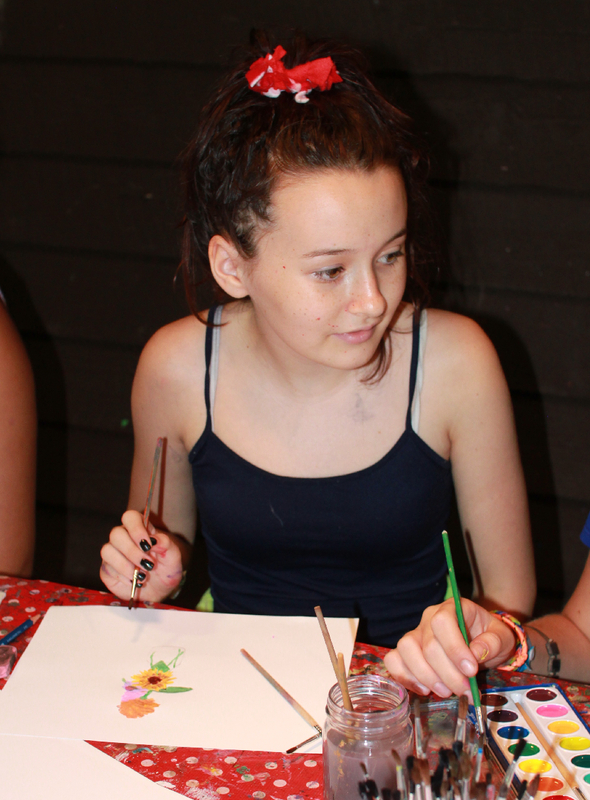 It’s also particularly striking how enthusiastic the girls are now for everything happening at camp. Cheers went up when the Nantahala River rafting trips were announced. 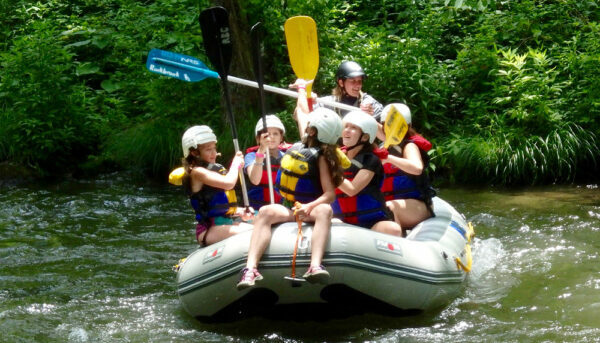 Everyday, the optional trips are filled: hiking to Black Balsam (one of the highest peaks east of the Mississippi), rock climbing on Castle Rock, and canoeing down the French Broad River, for example. 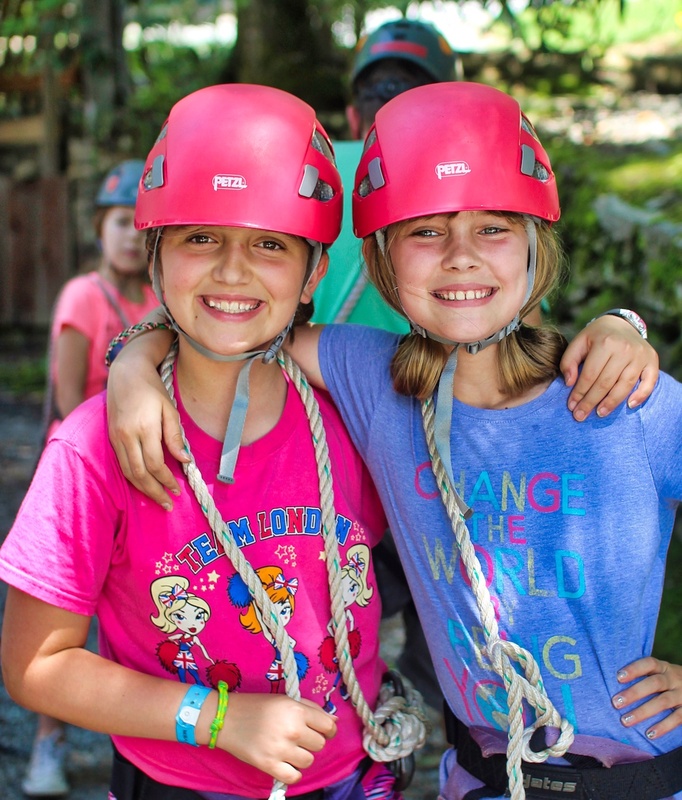 The girls are embracing every aspect of camp finding it both comfortable and thrilling… a little like relaxing in a red rocking chair chatting with friends and whooping with delight while flying through the trees on the zipline. It’s amazing how these Rockbrook girls are having this much fun so quickly and thoroughly. 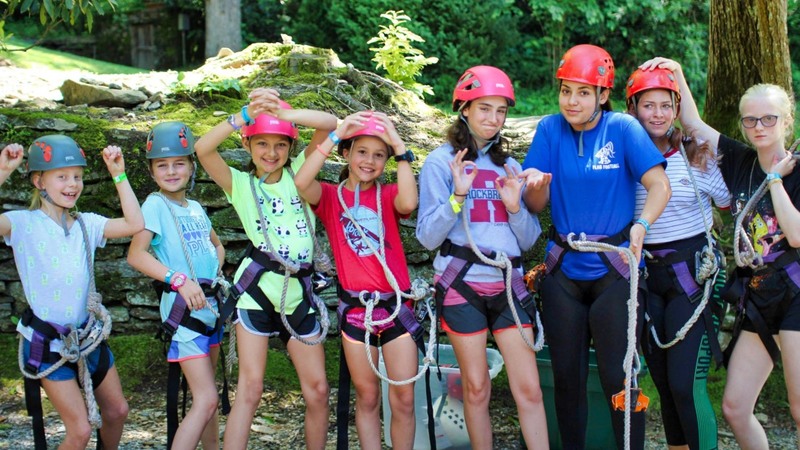 I’ve been thinking about this, about why girls adapt so well to life at Rockbrook, and I think one important factor is the all-girl environment here… but in a very particular way. 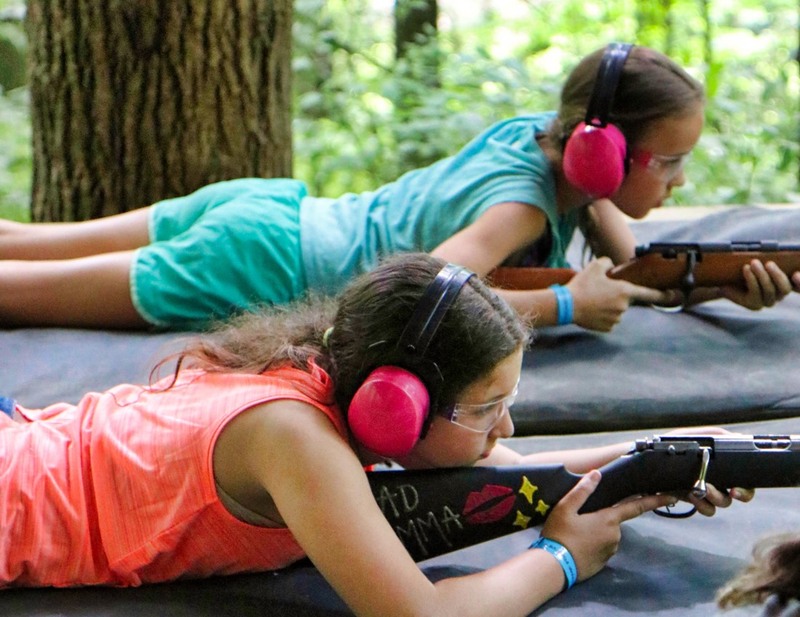 The most common thing you’ll hear about the benefits of an all-girl camp or school is that boys are a “distraction” and that removing them allows girls to be less preoccupied with their appearance and how they compare to boys’ abilities. That seems true, but I doubt it’s that simple. An all-girl community also has to embody other, more important principles or the same competition, self-evaluation, and social hierarchies common to mixed gendered groups will color everyone’s interactions and relationships. So, I would say there’s nothing automatically wonderful about an all-girl setting. 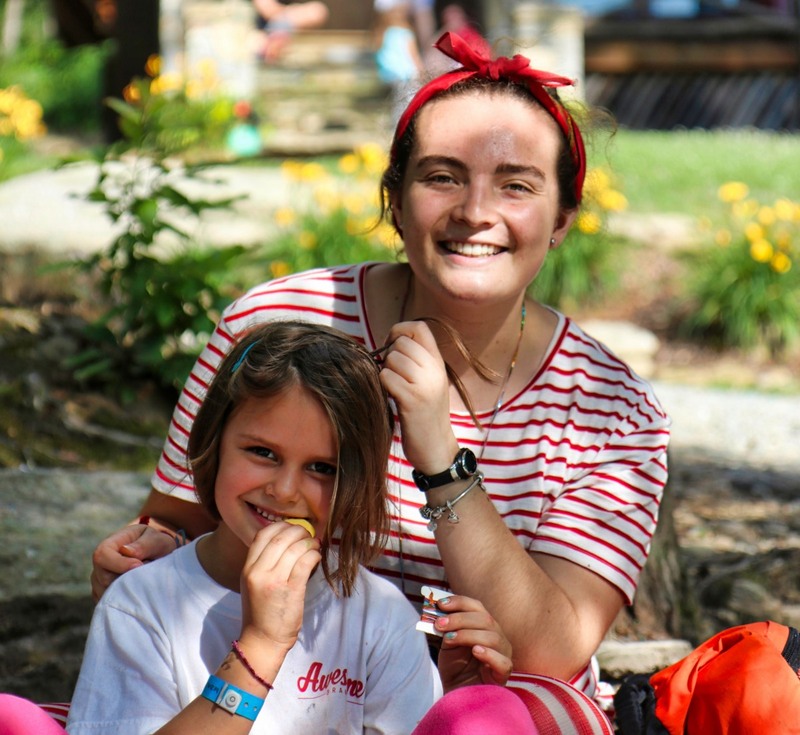 There has to be something more fundamental also, something that when established and deeply rooted first and then expressed in an all-girl community, we can identify as the secret to camp life at Rockbrook being so easily and eagerly taken to heart. Perhaps surprisingly, I don’t think it’s the range of activities offered, the mountain environment, the delicious food served, or the top-notch staff members at camp. These too are simply the context for what really makes our camp community work. 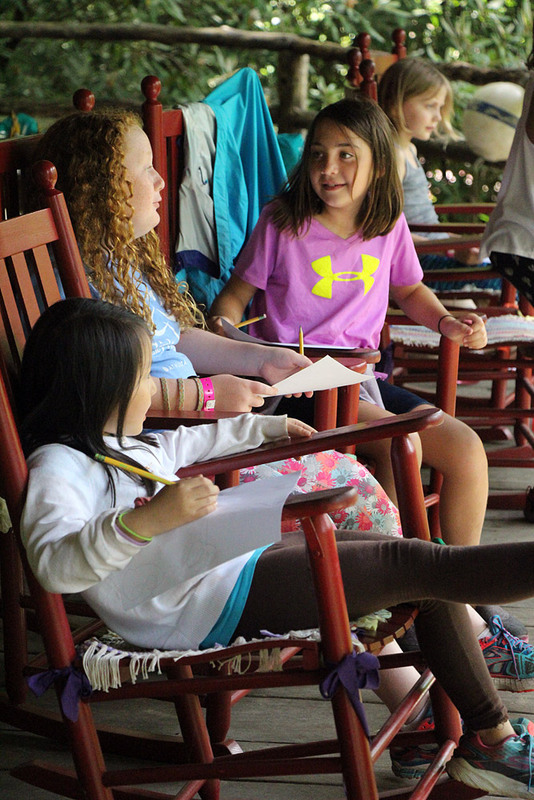 No, I think the core value defining camp life at Rockbrook is care. It sounds simple, but starting with the relationships we have with each other, striving to reorient them in the spirit of compassion and generosity, is the key. 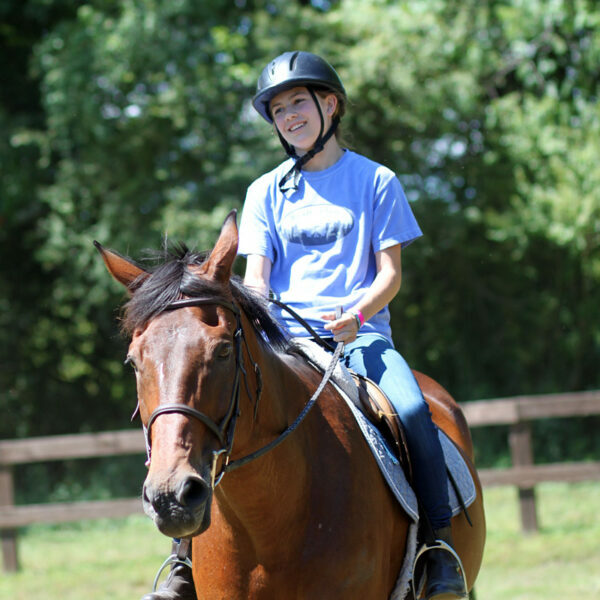 Beginning with our staff members, who were selected because they are genuinely kind, caring people, but also modeled by the directors and specialty activity instructors, everyone at camp is supportive, encouraging and kind toward each other. Whether playing tennis, collaborating on the plan for an evening program skit, or taking turns sweeping the cabin each morning, the people at Rockbrook truly care for each other. It’s this core community value, this practiced ethic applied to our relationships with each other, that gives camp life its special energy. 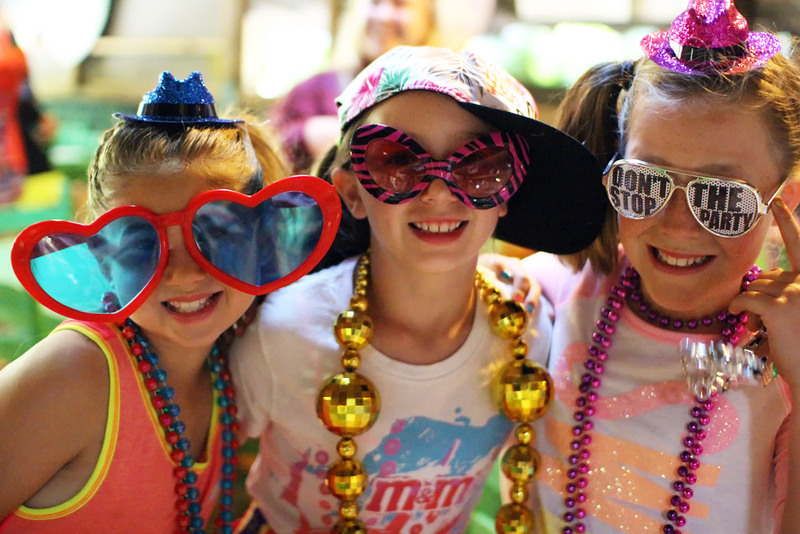 Being an all-girl environment is important but only as it serves the primary goal of making everyone at camp feel included, equally loved and respected. 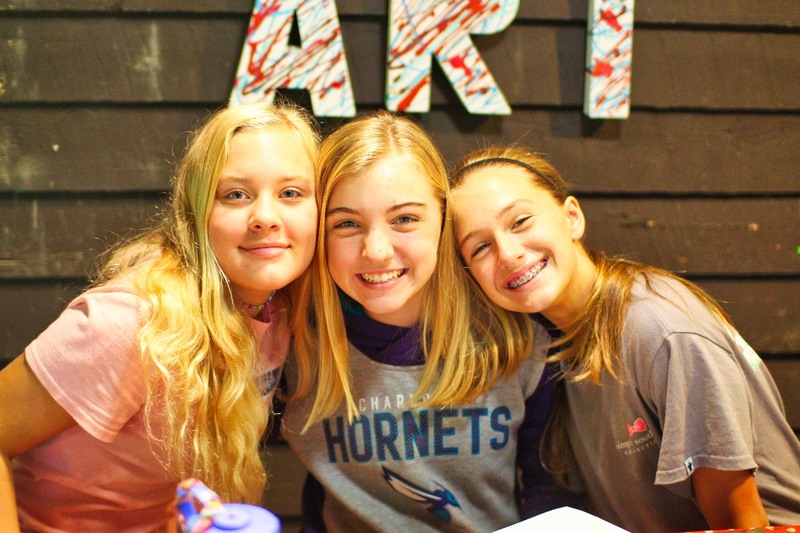 Perhaps it’s easier for girls to be kind and caring toward each other than it might be toward boys, and that can explain why a girls camp community like Rockbrook enjoys this happy vibe. It’s just a hunch, but I think there’s something to it. As our first week of camp hit its stride today, the campers seem to have simultaneously relaxed and energized. It makes sense when you think about it. After these first few days, any initial jitters have been calmed by the friendly atmosphere here, the smiling counselors who are always ready to encourage, the overall feeling of openness and acceptance that colors everything. At Rockbrook, there’s simply no pressure to measure up; we don’t compete for awards or recognition for being the best at something. Instead— and this can take a few days for girls to realize —the camp environment, Rockbrook’s culture, substitutes caring for criticism. It finds friendship before judgment, silliness and laughter before concern. Within the structure of scheduled activities and periods of free time, the girls here have the freedom to try new activities (climbing, shooting, weaving! ), to follow their whim meeting and playing with scores of wonderful inspiring people, and to explore what they enjoy, expand what they know, and develop who they are. It’s a strange but wonderful feeling of deep happiness and well being that springs simply from being in this kind of genuine supportive community. Out of this relaxation bubbles energy and excitement. 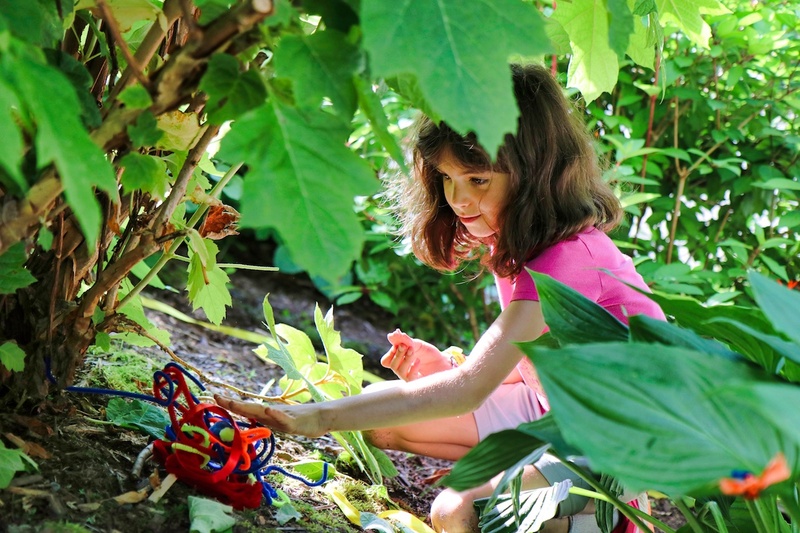 It’s inevitable; with this freedom comes all sorts of activity, from thrilling outdoor adventure activities like screaming down the RBC zip line course, to the concentration and creativity that combine to tie friendship bracelet patterns. Letting go at camp inspires you to overcome challenges, to join a big group playing gaga ball, for example. It stiffens your nerve at the top of the 50-foot tall water slide. It elevates your voice to sing louder in the dining hall. 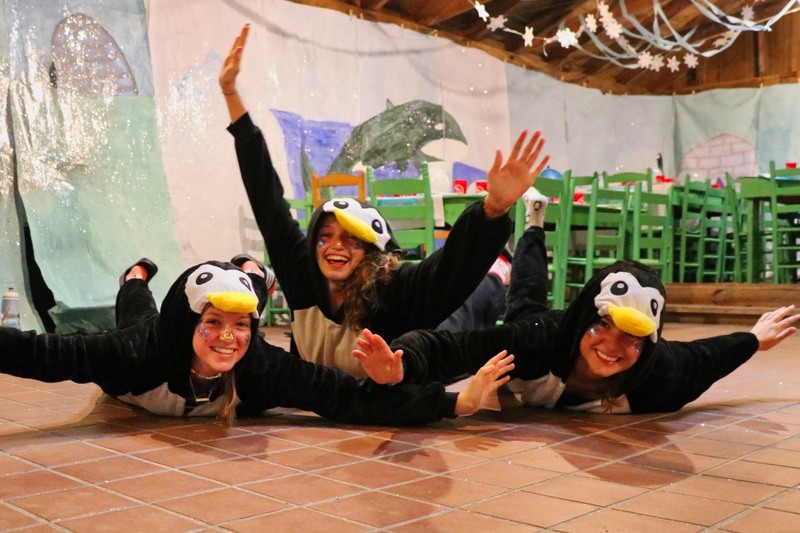 Suddenly, wearing a crazy costume, or making up a dance with your cabin mates, or lying on the grass in the dark to stargaze, or getting really dirty in the creek— all seem perfectly normal. 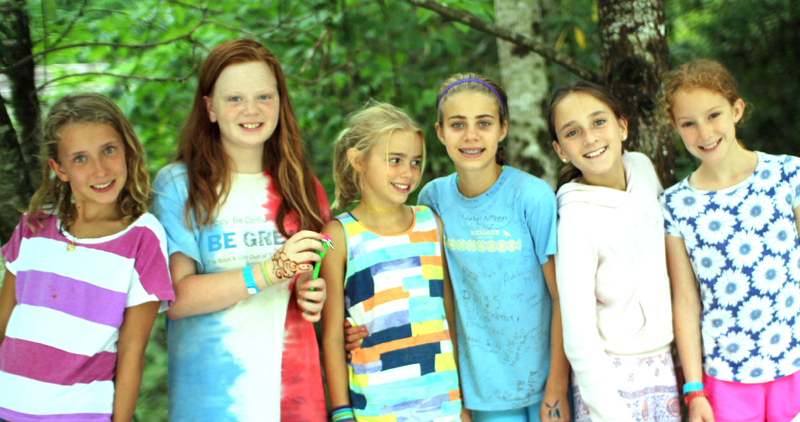 Relaxing into camp life, fully embracing the contagious kindness of our camp community, is deeply encouraging. Of course, this all adds up to what the girls simply call “fun.” It’s fun to have friends like this, to be with them all day and night, to get to know each other this genuinely. It’s fun to feel supported by everyone around you, and thereby find the confidence to step far beyond what you thought was your limit. It’s fun to make things, to be this active all day, and laugh this much. It’s fun to exercise your personality so thoroughly, to empower your creativity, your compassion, your awareness of the world around you. It’s fun to have a break from “real life,” from (yes, believe it or not) the distractions of technology, and thereby discover so much to experience and appreciate. The girls will say it was fun to roast s’mores over the campfire, to ride horses, and to swim in the lake, but I think there’s something more fundamental and lasting at work. Today, after just a few days, it was so entirely clear. For your girls, camp provides the freedom they crave, the challenges they need, and the full-bellied fun they love. The other day I was talking with a young counselor about camp and whether there was anything about the experience this summer that has surprised her. She had attended camp for 7 years as a camper already, so I was curious if she recognized anything different now that she’s older. 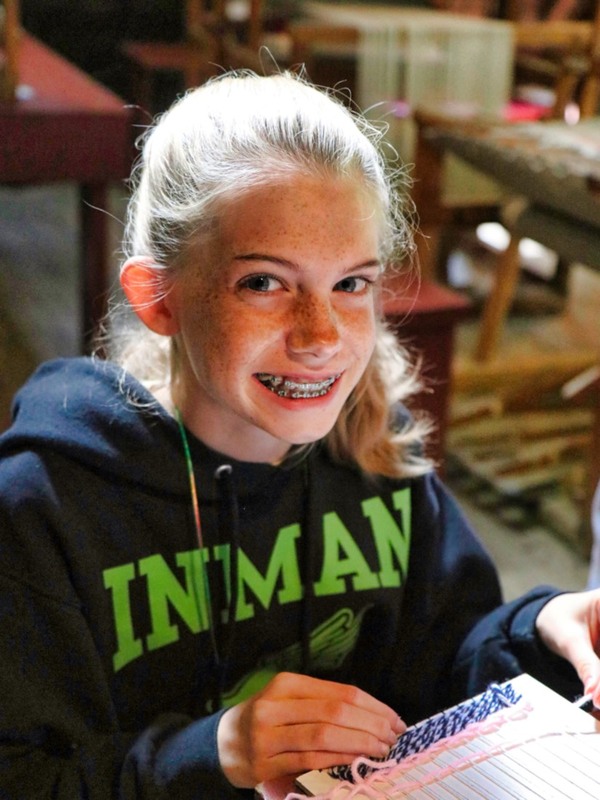 She quickly said that she was having a blast with the campers in her cabin, and that she loves being a counselor because she gets to know the girls so well and do so much with them. She was surprised how “intense,” “emotional,” and “fun” camp is. By making this observation, I think this young woman, without knowing it, was also commenting on ordinary life outside of camp. Essentially, it lacks the closeness, the rich, personal experience that defines our days at Rockbrook. Ordinary American life, generally speaking, is more about individual consumption, privacy, personal advancement, and ego-centric entertainment— all while being mostly blind to the other people around us. As we speed along the course of our lives, tightly tethered to our smartphones, community is too often left in the dust. Feeling dis-connected, bored and alone, can easily be the sad remainder. There’s an irony to this, too. Think of all the daily technology we utilize ostensibly to be more connected to each other: text messaging, emails, social media posts, and telephone calls. Thanks to modern communication technology, it’s simple to announce what you’re doing, ask someone a question, or look up information. The ease and convenience of using these technologies has made them ubiquitous threads of modern life. At the same time— and here is the irony —it seems they are isolating us as human beings. Sending a text message is a thin gruel compared to the deep feelings that accompany being present with someone you care about. An email conveys only a shadow of its sender. Facebook, despite its attempt to offer a “multimedia experience,” can’t touch the emotions of being with supportive friends. There’s no electronic translation for kindness. If our ordinary lives are increasingly defined by these diminished forms of communication, if we’re left with only these rarefied connections to other people, then, as we become more isolated, our humanity is going to suffer. Thank goodness for camp! Here we feel more connected than ever despite (maybe because of) giving up our electronic communication devices. For good reason, we unplug to connect more fully to those around us. 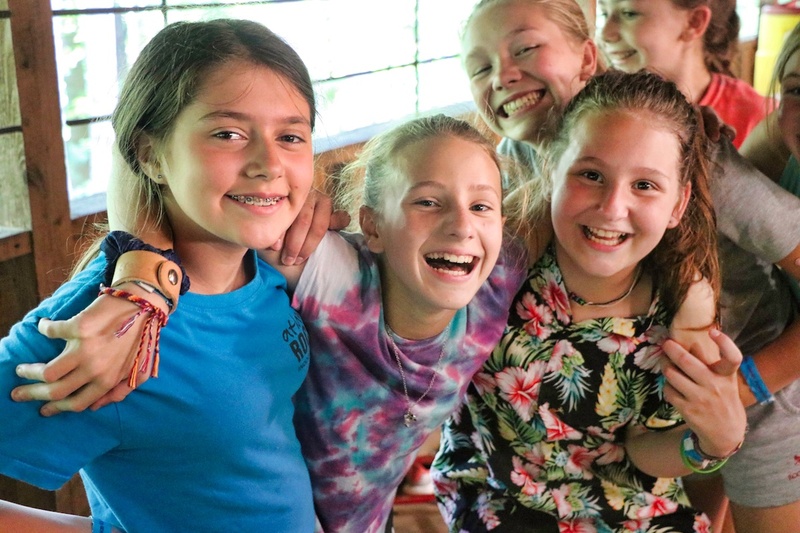 Life at camp feels good because it begins with wholehearted connections, with the messy and rewarding energy of a community. 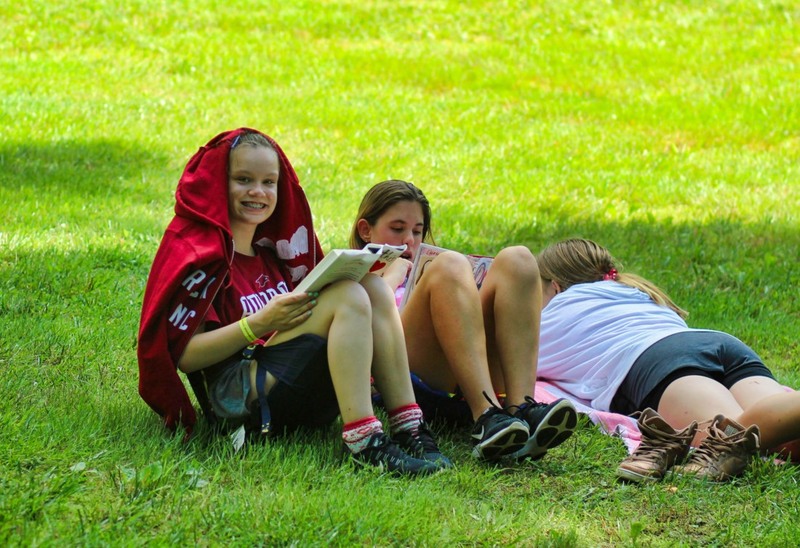 The contentment your girls feel at camp springs from living face to face, directly and without the filtering “convenience” of technology. It’s providing them proof that having kind, compassionate relationships with other people is a bumpy, fun path to a rich and rewarding life. 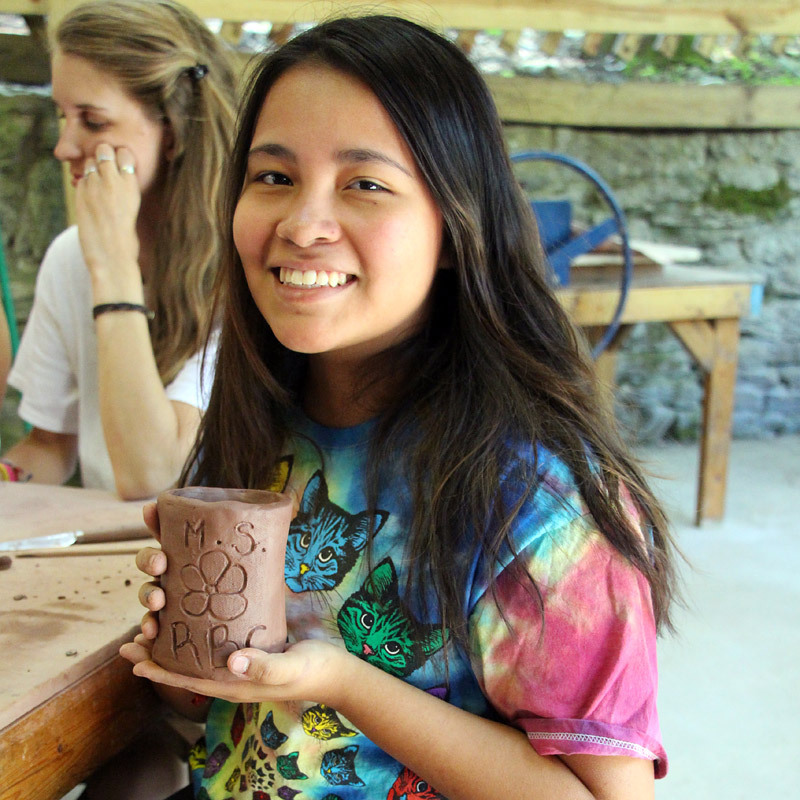 Describing camp life, revealing what makes simply being here loved by the girls at Rockbrook, is really difficult. Of course, we try all the time —by writing regular blog posts, and posting hundreds of photos to our online gallery— but the experience is too rich, too complex, and too emotional to convey completely. Fortunately, there is video, and we have a great one to show you. Robbie Francis of Go Swan Filmworks has been working with us this summer to produce several short videos about Rockbrook. Here is his most recent. Take a look! You will love it. P.S. Be sure to have the volume turned up. Hearing camp is amazing!